The genome era in medicine is upon us. Questions that arise from patient and family care are a watershed for research and technology, which in turn fuel the cycle of opportunity for impact through delivery of health services, which feeds back to families. Medical infrastructure needs to adapt to the dramatic pace of technology development in the wake of the Human Genome Project, in order for genome data to be delivered as information and applied as knowledge to benefit health. Medical practice and research have entered the genome era. The evolution from medical genetics to genome medicine (or genomic medicine) has been gradual and reflects a continuum [1, 2], but there has been a marked transition in the few years since the completion of the first human reference genome sequences [3, 4]. From a predominant focus on single genes and disease-related mutations has emerged the technology to assay the genome in its entirety - with genotyping arrays or sequencing - and the first means to interpret findings in a comprehensive manner. The application of genomic medicine involves diagnosis, prognosis, prevention and/or treatment of disease and disorders of the mind and body, using approaches informed by knowledge of the entire diploid genome and the molecules it encodes. The foundations of genetics as the study of heredity become illuminated when individual genes are seen in the context of the whole genome and environmental influences. Our growing understanding of the human genome and the processes it directs strengthens the foundation for this new paradigm in biomedicine. The term 'directs' quite explicitly describes the role of the genome with respect to phenotype, and the distinction from 'determines' is critical. Particularly in the transition to a genomic focus in medicine, we recognize factors that are individually more modest in their impact than those highly penetrant alleles amenable to earlier genetic analyses. Beyond the influence of the context of the full genome, there is interaction with epigenetic and non-genetic elements from the environment and experience. The cyclical nature of genome investigation is driven by a constant flow of knowledge between medical practice and research (both 'bench to bedside' and 'bedside to bench' ). A conceptual analogy can be made with another natural cycle: the water cycle (Figure 1). In such a model, genome investigation guides informed research questions, which yield solutions that feed back to individuals, families and populations in a natural progression, and which have an impact on health. The genome informs the patient, and the patient informs the genome. The cycle of patient- and genome-informed questions and answers in medicine. 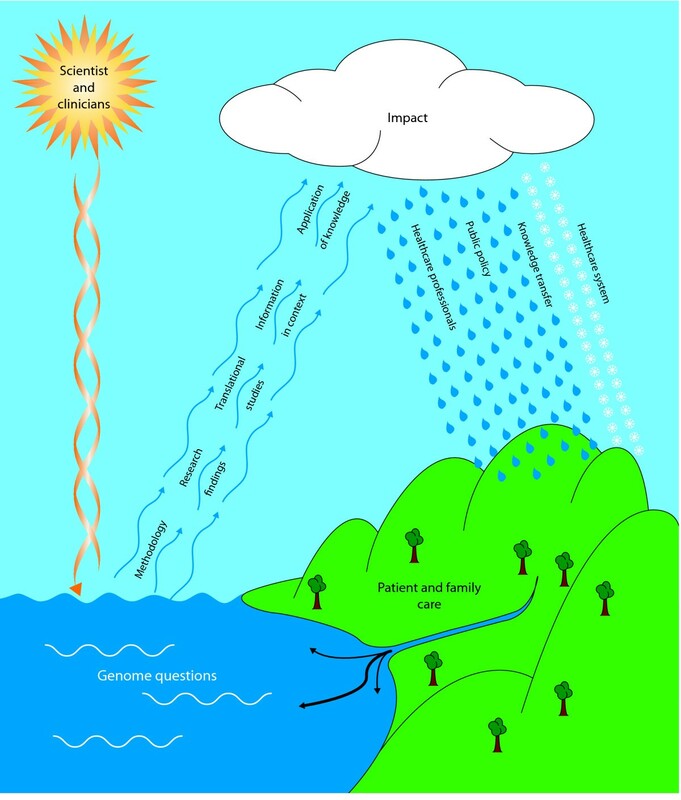 Set against familiar images depicting the water cycle, this analogy emphasizes the natural flow of such a process and the influence of environmental factors. The ground(work) of the genome medicine cycle is the front-line work directly with patients, families and populations. This feeds into the sea of questions to be addressed from clinical or research perspectives. Investigators work to illuminate the questions, and the research process raises information to a relatively amorphous position of potential impact. Information can be converted to knowledge and delivered through various conduits to patient care, which includes aspects of diagnosis, prediction and intervention, thereby maintaining the cycle. Genomic medicine reflects not just a quantitative change in approach (single genes to many genes), but also various qualitative shifts in focus . In these early days of whole-genome assays, efficiency of data collection may be enhanced, but the interpretation of findings still tends to be in terms of discrete gene loci, and the meaning of independent variations in the sequence. From among a list of variant findings, the question still seems to be: 'Which one of these is a good candidate for causing the disease in question?' In time, the reductionist approach will give way to one that is more holistic, when advanced analytical tools will facilitate questions more like: 'What is this overall pattern of observations telling us about this individual, in this situation, at this time?' A second qualitative shift is from the (often serial) hypothesis-driven approaches of genetic investigation, to the relatively hypothesis-free gathering of data from genomic sequence, somatic mutations or whole cells. Evidence of variation from such large datasets can then lead to comprehensive hypotheses of medical relevance for further consideration. Part of the comprehensiveness involves interpretation of the diploid aspects of the genome. Our growing understanding of the human genome and the processes it directs forms the foundation for this new paradigm in biomedicine. We recognize that medicine has moved into a genomic era by the evidence of changes and developments since the Human Genome Project  and some of these, along with a few new projections of developments yet to come, are described in Box 1. 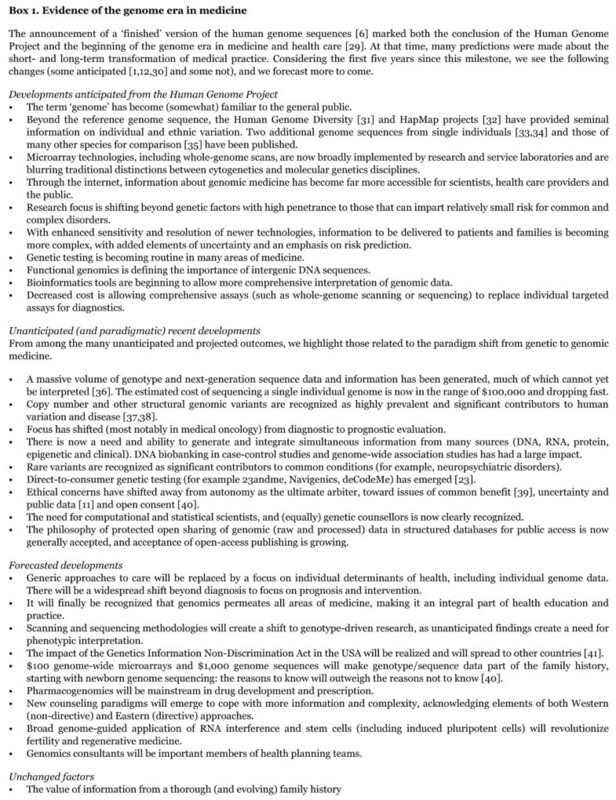 There are already increased opportunities to: (i) predict an individual's risk of particular disease, (ii) detect disease early and preempt its progression, (iii) provide individualized pharmacological agents and doses and other preventive interventions, (iv) anchor an individual's genomic data to complete health care information, and (v) provide new resources and answers to families, investigators and care providers to maximize health benefits. Nevertheless, the greatest potential is yet to be realized. Microarrays and targeted sequence analyses are already well established, not only for research, but also for clinical diagnosis . Arrays have become particularly helpful in the diagnostic investigation of children with global developmental delay, for whom sequential, hypothesis-driven assays had often been uninformative . The technical practicality of routine individual whole-genome sequencing is in sight ; this is the method with the highest resolution in gathering information for genome-based medicine. Clearly, however, this is a situation in which technology is well ahead of the means by which to handle the onslaught of information overload that is about to ensue [10, 11]. This is where the greatest anticipation and attention are needed. Many examples cited as benefits to be anticipated from genomic and individualized medicine pertain to common conditions of (typically) adult onset, such as cancer, heart disease, diabetes and susceptibility to infectious agents [12–14]. Pharmacogenomics is, of course, a realm with many exciting promises [13, 15, 16]. From our experience in a primary care pediatric hospital setting, we recognize numerous potential and newly realized benefits for newborns, children and young adults, as well as for their families. In one large study at a pediatric hospital, more than two-thirds of admissions, and fully 96% of those for chronic medical conditions, were identified as involving a recognizable genetic component . Below, we provide vignettes based on our personal experiences in genome medicine. These come from professionals whose primary responsibilities include genetic counseling, pediatric genetics, prenatal genetics, DNA diagnostics, pediatric oncology and genomic research. These stories illustrate how a priori knowledge of the genome has directed (or could have directed) medical treatment decisions, and how questions arising from patients and families have spawned new research initiatives. 'A' was first assessed at age 17 years, when admitted to hospital with severe back pain caused by multiple spinal neurofibromas. He also had moderate global developmental delay, attributed to a difficult delivery. Neurofibromatosis type 2 (NF2) was considered, but he did not meet the clinical criteria for this disorder. Initial investigations included karyotype and DNA testing for fragile X syndrome and NF2, all with normal results. Three years later, microarray testing revealed a 20 kb loss at 2q22.1 in his genome, involving the intron of THSD7B (thrombospondin type I). The specific function of this gene is not known, but the protein family is involved in angiogenesis, apoptosis and immune regulation. In addition, a 43 kb duplication was found at 7q33, overlapping an aldo-keto reductase gene, AKR1B10. Mutations in this gene lead to overexpression (cellular proliferation) and have been found in several cancer and precancerous lesions. Its activity seems to be inhibited by tolrestat , a drug approved for control of some diabetic complications; therefore, the microarray results have potential implications for medical treatment. We are now determining whether a parental balanced structural variant could underlie the findings in A, as this would have implications for recurrence risks in other family members. Infant 'B' was referred for assessment regarding asymmetric growth of his legs, with a discrepancy of 2.5 cm, and which orthopedic evaluation interpreted as hemihyperplasia. In the genetics clinic, however, it was difficult to determine by physical examination whether the asymmetry represented overgrowth on one side (hemihyperplasia) or undergrowth on the other side (hemihypoplasia). The distinction is significant, as children with hemihyperplasia are at increased risk for embryonal tumors - notably, Wilms tumor and hepatoblastoma; therefore, tumor surveillance is recommended, consisting of quarterly abdominal ultrasounds and blood work. B's short stature suggested a diagnosis of Russell-Silver syndrome (RSS), but findings were insufficient to assign this clinical diagnosis. Recently, at age 4, new testing by multiplex ligation probe-dependent amplification and methylation array revealed a loss of methylation in the H19 gene, which encodes an imprinted maternally expressed non-protein coding transcript, a finding associated with RSS . Given this genomic information, costly tumor surveillance is no longer indicated, and the family's anxiety is greatly relieved. 'C' was 19 when he collapsed and died during a hockey game. An autopsy revealed that he had succumbed to autosomal dominant arrhythmogenic right ventricular cardiomyopathy (ARVC, which has a prevalence of about 1 in 1,000), and DNA testing detected a hemizygous deletion of the gene encoding desmoglein 2 (DSG2, one of several genes and loci associated with the condition ). Microarray testing with genome-wide platform coverage would have detected this deletion, signaling the need for regular surveillance by cardiac imaging, probably intervention with anti-arrhythmic medications, and implantation of a cardioverter-defibrillator. Nonetheless, with an identified mutation, C's relatives have the option to be tested. Carriers can benefit from early detection; non-carriers can be relieved of the stress of uncertainty about risk, and the costs of lifetime testing by cardiac imaging. The clear benefits of such knowledge for improving prognosis and prevention drive the need for research to identify other genes associated with ARVC and their impact on phenotype. Two-year-old 'D' presented to the oncology service with ataxia. Computed tomography imaging demonstrated a large intracranial tumor, consistent with choroid plexus carcinoma. He underwent surgical resection and multiple cycles of chemotherapy, during which time a younger brother was born with respiratory distress, distended abdomen and 'blueberry muffin' purpuric skin lesions. Further investigations demonstrated a large adrenal mass with extensive metastases, amplification of the N-myc oncogene and (as seen by fluorescence in situ hybridization) a deletion of chromosome 1p; the infant was diagnosed with stage IV neuroblastoma. Chemotherapy was ineffective, and the baby died within three weeks. Shortly thereafter, D had a recurrence of an intracranial tumor with intraspinal metastases and died. There was no other family history of cancer. A clinical diagnosis of Li-Fraumeni-like syndrome was confirmed for these sibs when sequencing of the p53 gene revealed a heterozygous missense mutation (Arg158His) in DNA from both children, and subsequently in their unaffected mother. Whole-genome microarray analysis then demonstrated a significant excess of copy number variants (CNVs) in the genomes of both children, compared with a control population, whereas their mother's CNV frequency was not significantly elevated . These results suggest that excessive constitutional genomic CNVs can exacerbate the impact of a germline p53 mutation and be associated with a more biologically aggressive tumor phenotype. The parents are contemplating future pregnancy, and the combination of p53 sequencing and CNV analysis will be considered for prenatal testing. These are but a few early representations of the impact of genomics in medicine. Currently, Online Mendelian Inheritance in Man  lists approximately 6,500 phenotypes with a known or suspected Mendelian basis, most of which have some clinical significance. Additional phenotypes have a chromosomal or polygenic basis, and some direct our variable responses to natural and imposed environments - including to the medications we take. All of these phenotypes are poised to become associated with genomic findings as the next generation of comprehensive technologies becomes integrated. Collaboration among scientists and clinicians has fostered remarkable progress in the development of knowledge and technologies, yielding applications for diagnosis, prognosis and management of patients and families. Increasingly, we are finding solutions through cross-disciplinary consultation in genomic medicine. This progress may be constrained, however, by the inadequacy of educational tools to transfer the vast amount of knowledge to health care providers. With training that predates the genomics revolution, most practicing medical professionals are unprepared to cope with its pending impact. Even recent graduates have a genetics knowledge base that is rapidly becoming outdated. Educational interventions are needed quickly, and these may well be driven by the questions of an internet-using public as well as by various commercial ventures [10, 23, 24]. Opportunities and challenges for the genome era also need to be recognized by policy-makers and health funding bodies . Only with appropriate health care systems in place can there be progress or benefit from the revolutionary technological advances that genomics has to offer [23, 26]. Most immediate is the need for a new generation of technologists and genetic/genomic counselors trained to interpret whole-genome data . Furthermore, we need technology for health information tools, such as electronic capture and filtering, to facilitate the collection and interpretation of medical histories, genomic variants and even patient choices. Health care professionals will need ongoing electronic resources for point-of-care information to keep up with new knowledge. We strongly advocate initiatives, such as that undertaken by this journal, to promote scholarly works that combine basic research and clinical data with consideration of their medical applications and implications. No longer is it sufficient to be merely descriptive, but interpretation should also be prescriptive, with recommendations for management and anticipatory care. The full impact of genomic advances in health care will be realized when the cycle of information among patients, scientists, clinicians and caregivers is continuous, and all are equally enlightened and empowered to make decisions. We should expect and settle for nothing less, for genome-directed medicine has the potential not only to mitigate the impact of some of our genes by our knowledge of them , but to provide reassurance about the vast majority of the others. Supported by The Centre for Applied Genomics, Genome Canada/Ontario Genomics Institute, the Canadian Institutes for Health Research (CIHR), the Canadian Institute for Advanced Research, the McLaughlin Centre for Molecular Medicine, the Canada Foundation for Innovation, The National Cancer Institute of Canada (to DM) the Ontario Ministry of Research and Innovation, and the Hospital for Sick Children Foundation. SWS holds the GlaxoSmithKline-CIHR Chair in Genetics and Genomics at the University of Toronto and the Hospital for Sick Children. JAB and SWS drafted the manuscript with written contributions from all other authors. ARC designed the concept for Figure 1. PNR and SWS oversaw laboratory analyses, and DC, DM, CS and RW were involved with care of the families whose stories they told. All authors read and approved the final manuscript.